At Picture to Puppet and Leith Toy Hospital, we get lots of different teddy and puppet repair jobs through the door. Nevertheless, last night I was slightly surprised by an emergency call out to mend a huge bear with a broken jaw! Thankfully it wasn’t a real one, but an enormous and very beautiful puppet used in a fringe show, a stage adaptation of Rayomnd Briggs’s “The Bear”. I’ve got very fond memories of having this lovely book read to me as a child, so was excited to have the opportunity to work on the stage version and carry out a puppet repair in the Edinburgh Fringe. When I arrived, the bear’s jaw was hanging open and he couldn’t close it. After a while I figured out that the rod that the mechanism hinged on had snapped, an integral piece of foam had come adrift and the elastic had lost its elasticity over time. It took most of the evening, but thankfully I had the bear roaring happily again in time for his next show! 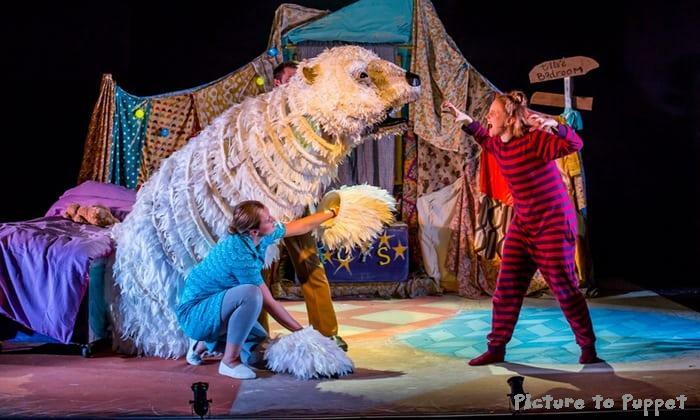 Luckily, spending Wednesday evenings contorting my body into bizarre positions inside the head of a polar bear is all in a day’s work here at Picture to Puppet. Contact us if you have any puppets in need of urgent attention! Or visit https://picturetopuppet.co.uk/ to find out more about Picture to Puppet.